Beauty is not skin deep. Beauty comes from within. But us ladies, we want a bit more. When it comes to maintaining our skin clarity, elasticity and youthful appeal, we are willing to admit, even if only to ourselves, that we would do anything to look 20 for ever. Here’s what we’re using this month. I am addicted to this face cleaner. The pore-refining pineapple and skin-brightening papaya enzymes wash away impurities, make-up and dullness. Aloe, hibiscus and passion flower provide much needed R&R to soothe and balance. It’s total tropical radiance. It smells like pineapples and papayas, with a soft gel consistency that will leave your face clean, not stripped, without causing any irritation. It is hypo-allergenic. 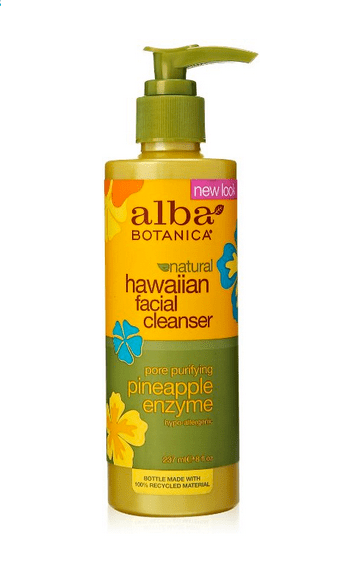 Here’s a makeup remover/face cleanser that won’t dry your face with alcohol or soaps, and won’t need any rinsing after. Take your makeup off with micellar water, without getting clogged pores, black heads or breakouts. I cannot say enough good things about this product. It has a delicate smell and it cleans perfectly. It is good for sensitive skin (rosacea or allergy prone skin) as it is made with mineral water from the mountains of Avène region in France. You don not have to use face cleaner after. The skin is left clean and refreshed. Apply your serum and lotion right after, or if you’ve had a long day and just want to go to bed, don’t worry, your face will look great in the morning as there are no stripping agents in this micellar water, just pure goodness. For those of us that love wine, this is the next best thing, or maybe even the better thing. It’s made with the science of the vine, with ingredients like vitis vinifera (grape) fruit extract, viniferine, olive squalane, mint, caraway and galbanum, your skin is oing to thank you every time you use this product. And if you have any issues with your skin, like sun spots, or scars, or rosecea, this serum is meant to wipe those away with an eraser. Give it time, and you’ll see the results just like we did. This is yet another staple in our cabinet. With summer around the corner, we thought we get you started on some skin protectants and brighteners. Your skin needs moisture and protection. This day cream is light enough for every day use, and efficient enough to protect your sensitive skin from environmental stressors like pollution. With the SPF 18, you can wear this with or without makeup. This is a light and moisturizing cream, and it helps with dark spot prevention as well as diminishes the existing ones. This is one of those eye creams that you only wish you’ve had 5 years ago. It smooths away crow’s feet and lines between the eyebrows, decreases puffiness, and it is an overall great eye cream from “temple to temple”. A bit on the pricey side, use it, and you’ll say what we said: it is worth every penny! Ideal for women who wish to maintain total eye beauty while experiencing natural hormonal changes due to the aging process. For an overall cream, this is cream takes the top. It is light enough for using under makeup, and consistent enough that it can hold it’s own as a night cream. It goes on smooth and it absorbs fast, leaving skin fresh and relaxed. With a delicate smell, this can be your go to cream. Immortelle is a flower with exceptional longevity: it never fades even after it has been picked. L’Occitane has led the first organic and sustainable Immortelle plantation program in Corsica, ensuring its quality and traceability. Its organic essential oil is rich in active molecules offering unique anti-aging beauty results. We love it. ← #EqualPayDay! But not in Sports! Or for that matter, anywhere else!